Learn about the origins of Celtic history, including how the Celts used the land, in his informative extract which, through pioneering archaeological evidence, traces the emergence of the continental Celts from the fifth century BC onward. The period from the Greek geographers’ and historians’ first mention of the Celts by name until the political decline of the continental Celts, as a result of the expansion of the Roman empire and Germanic pressure, spans the last six centuries BC. Within this period, we meet the Celts in an area extending from the Iberian Peninsula in the west, across present-day France and northern Italy and the Balkans into Asia Minor in the east. The writings of antiquity and archaeological evidence form the main sources of our knowledge of the Celts of that era, but written sources mostly skim lightly over long stretches of time, so archaeology often provides our only information. To archaeology we also owe the greater part of our knowledge of daily life, forms of economic activity and settlement, and the structure of society and religion in those centuries. 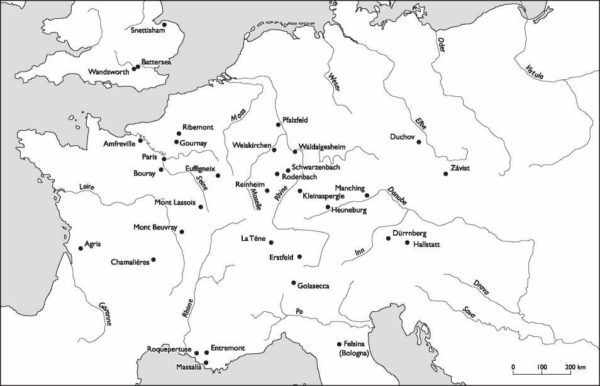 The first archaeological evidence of the Celts of central Europe appears in the late West Hallstatt culture, which in the sixth and fifth centuries BC extended from southern France across Switzerland into south-western Germany. The material underpinnings of this civilisation were provided mainly by agriculture and animal husbandry, but crafts and trade were also important. Evidence of these areas is seen clearly in archaeological remains, and from these we can also draw valuable conclusions concerning the organisation of society, the world-view and the religious outlook of the period. Naturally, the environment in which the early Celts lived differed in many respects from our own. Compared with modern conditions, the landscape they inhabited was largely untouched, except for larger settlements. There was no developed network of land routes, and natural watercourses provided the chief means of transporting merchandise. No streams and rivers were controlled, and vast forests harboured a great variety of animals. The mobility of the greater part of the population was limited, and most people’s lives ran on well-defined tracks and within a relatively restricted cultural area. With regard to land use, the early Celts of central Europe belong in a tradition that can be traced, using archaeological deposits, from the Neolithic, through the Bronze and Iron Ages, and into the Middle Ages. The wooden plough was introduced into early European farming as far back as the third millennium BC, and the Celts knew a much improved version with an iron ploughshare. Crops such as barley, rye, oats, emmer, spelt and wheat, fibrous plants such as hemp and flax, and legumes such as peas, lentils and horse beans were cultivated, as well as woad for dying fabrics. The most widespread domestic animal of the period was the ox, which could be used as a draught animal in the fields and for transporting heavy loads. The meat was eaten and the hide made into leather, while the cows provided milk and butter. Pig-rearing was most significant inland, as woodland pasture was the pig’s most important food source until the introduction of the potato in the early modern age, and herds of swine could be kept only close to large beech and oak forests. Bone remnants show that both cattle and pigs were markedly smaller than the corresponding wild species and smaller than modern breeds, a fact which is attributed to the difficulty of caring for the beasts during the winter. Goats and sheep were less widespread than cattle and pigs. Sheep were reared mainly for their wool and played only a secondary role as a source of meat. Horses served for riding and as pack animals, and probably also figured to some extent in cultic rites, as evidenced by the use of horse trappings as grave goods, as well as by representations of horses. Dogs were probably used as watch and guard animals, and to control vermin such as rats. In addition, according to later accounts by Greek and Roman authors, specially trained hunting dogs were used to track, hunt down and kill game. Deposits of wild animals’ bones in settlements show the wide variety of animals hunted by the early Celts: in addition to big game such as aurochs, bison, bear, red deer and wild boar, smaller animals such as roe deer, badgers, beavers, hares, wolves, foxes and many kinds of birds were hunted. Hunting, however, was probably motivated by the need to protect livestock or prevent damage to crops, rather than a need for meat. In view of the small returns for the large expenditure of time, hunting must have been mainly a privilege of the upper stratum of society. The Celts: A History From Earliest Times To The Present (Second Edition) is forthcoming in December from Edinburgh University Press priced £19.99.